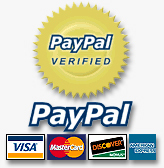 Allied Furnace Filters accepts VISA and Mastercard via phone and online payments through PayPal. Paypal adds the ability to make your payment with American Express, Discover or eCheck. No checks or money order accepted. Secure transactions are important to us. This is the main reason why we currently use PayPal. You can also call 503-898-0045 Mon - Fri 9am to 4pm Pacific Time and one of our staff will speak directly with you and process your transaction. Our staff is very experienced in the filtration of indoor air. We have been in the heating and cooling industry since 1978. We want you to be satisfied with our products. Identifying what your needs are before the order is the best way we have found to avoid problems and selecting what products are best for your specific needs.